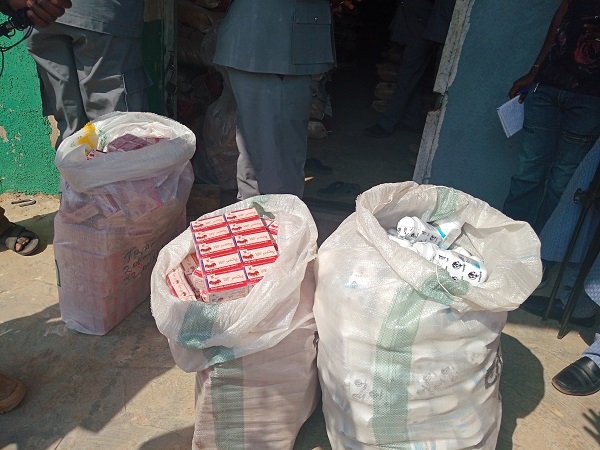 The Nigeria Customs Service General Strike Force team has seized 1,926 packets of 200 milligrams of Tramadol, 2,190 packets of 225 milligrams of Tramadol Royal and 218 packets of 50 milligrams of Penkidol worth N43.1 million in Niger state. The trailer conveying the drugs was apprehended along Suleja-Minna and was said to be heading from Kogi state with its final destination to Kontagora/kebbi. He pointed out that the Tramadol found was above the limit allowed by law which was the reason why it was seized adding that although the arrest was made with suspects, the suspects had been released on administrative bail while investigation is ongoing to unravel the real owner of the goods. Kirawa also disclosed that the Strike Force team also seized 733 50kg bags of imported foreign parboiled rice valued at N11.5 million, 110 bundles of 330 pieces of used tires, 18 bales of second-hand clothing worth N648,000, one used J5 bus with duty paid value of N1.3 million and a used Pontiac Vice with duty paid value of N648,000. The National Coordinator of the Strike Force team stated that the people that engage in the illicit and illegal trade will stop at nothing to ensure that their wares are distributed to the nook and crannies of the country declaring that the Strike Force team will leave no stone unturned in bringing an end to smuggling in the country. â€œImagine the danger that the drugs we seized would have had on the youths and the Society. The negative effect will be enormous as the youths who use it would pose a security challenge to the society. Kirawa then called the people to be involved in intelligence gathering stressing that public sensitisation is important on ensuring that the scourge of smuggling is eradicated.